Visit the Scrapbook & Card Kits section of the store to see our great selection of scrapbook album kits, page making kits, and card kits. 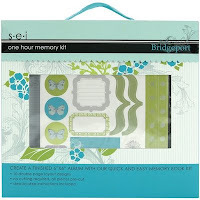 The One Hour Memory Kit from SEI is a complete scrapbook album kit. It includes all the materials you need to create a 6" x 6" designer memory book. The style, called Bridgeport, is an ideal all-occasion scrapbook design. SEI's one-hour memory kits were designed with quick scrapbooking in mind! Each kit includes pre-cut paper pieces, post-bound album, coaster tags, die-cut stickers, custom ribbons, and brads. 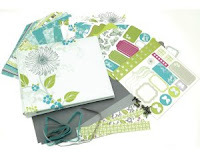 This is a great scrapbook kit for beginners to create their first album. Each kit includes step-by-step instructions for creating a personalized album with 10 double page layout designs. All you need are photos and an archival-safe scrapbooking adhesive to adhere your photos to the pages. All of the pages will be perfectly coordinated. Your completed album will be a lasting family keepsake. Make a second album to give as the perfect gift! Visit the Paint & Draw Art Kits section of the store to see our complete selection of beginner art kits, including a variety of creative painting kits and pencil drawing kits. And now you can take your scrapbook journaling to the next level with our newest kit - Calligraphy! 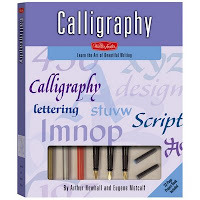 The Calligraphy Kit from Walter Foster is a complete kit for beginners to learn the art of beautiful writing. Kit includes a cartridge calligraphy pen, pen nibs, ink cartridges, felt-tip calligraphy markers, calligraphy paper, guideline sheet, artist's triangle, and practice paper pad. Learn to create beautiful lettering with this starter set that includes the tools, materials, and instructions you need to get started. Calligraphy adds a creative touch to any written correspondence. You'll have fun applying your new lettering skills to special occasion cards for friends and family. Weekend Kits offers a wide selection of creative project kits for you to explore. Learning a new craft is a great way to spend your weekends and kits make it so easy to get started right away! Make sure to see our new selection of jewelry making kits from Walter Foster. These new kits include the materials and instructions you need to make your own jewelry at home! You'll find them in the Jewelry Kits section of the store. 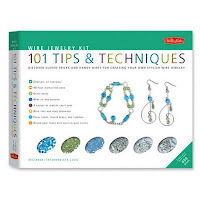 The 101 Tips & Techniques Wire Jewelry Kit is ideal for beginner to intermediate level wire beading crafters. Just as the name suggests, there are 101 jewelry making tips and techniques for you to learn and apply to creating your own beautiful wire jewelry at home. 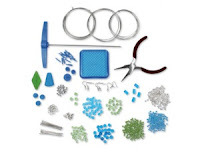 This complete jewelry kit includes a 48-page instruction book, bead tray/organizer, glass beads, resin focal beads, round-nose pliers with built-in wire cutters, wire-working jig with pegs, mandrel, beading wire, clasps, earwires, and findings. After learning the techniques, you'll follow the demonstration provided in the book to make a coordinated 3-piece jewelry set, including necklace, bracelet, and earrings. Detailed illustrations are provided throughout, so you always know what your piece should look like as you go to the next step. This is a great starter kit for learning to create wire jewelry! 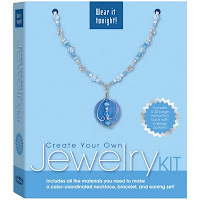 The Create Your Own Jewelry Kit is a Wear It Tonight! jewelry making kit. You'll learn techniques to make your own matching necklace, bracelet, and earring set. Instructions for 4 unique designs are provided. This jewelry kit includes more than 350 glass beads, a resin disk focal bead, beading wire, lobster-claw clasps, jump rings, fishhook earwires, and a 32-page instruction booklet. You'll need a few basic jewelry making tools to make the pieces demonstrated in this kit. Choose from 4 color options, including blue, purple, pink, and green. This is an ideal kit for creating a unique jewelry set to coordinate with an outfit or dress for a special event, such as a prom, anniversary, or dinner party. 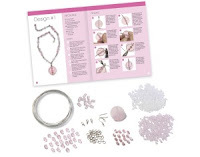 Visit the Jewelry Kits section to see our complete selection of beginner jewelry making kits. Weekend Kits offers a creative selection of DIY craft kits across a variety of crafting categories. Kits make learning a new craft easy, convenient, and fun! Visit Weekend Kits today and get ready to start making jewelry on your next Weekend at Home. We have new cross stitch kits for baby in the Embroidery Kits section of the store. 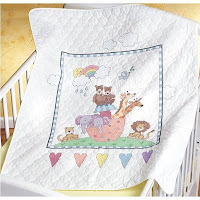 Our newest baby ensemble from Janlynn features soft pastel colors and a charming Noah's Ark theme. Quilted Crib Cover, Birth Announcement & Baby Bibs! 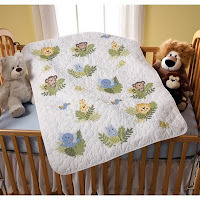 The Noah's Ark Stamped Cross Stitch Baby Quilt Kit includes all the materials you need to make this beautiful quilted crib cover for baby's nursery. Kit includes a prefinished quilt, embroidery floss, needle, graph and instructions. The quilt is prestamped with the cross stitch markings. Size is 34" x 43". Embroidery Supplies you'll want to have on hand for your needlework project include an embroidery hoop and scissors. Optional accessories include an embroidery needle threader and floss organizer. The Noah's Ark Baby Birth Announcement Kit is a counted cross stitch kit for creating a lasting keepsake of baby's birth record. Kit includes white 14-count cotton Aida fabric, embroidery floss, needle, graph and instructions. An alphabet is included for recording baby's name and birth date. The finished size will be 11" x 14". Add a mat and frame and it's the perfect gift to give new parents & baby! The Noah's Ark Baby Bibs Embroidery Kit includes 2 quilted baby bibs, charts, needle, and instructions. You'll enjoy seeing the bibs you made on baby! Finished bibs are approx. 9-1/2" x 11" each. Stamped cross stitch baby bibs are an ideal embroidery project for beginners. The X's are prestamped on the bibs. The charts show you which colors to stitch on the fabric. Embroidered baby bibs are a fun baby shower gift idea and all of the Janlynn baby kits include a free gift card with envelope. New Baby Collection - Coming Soon! In the next couple of weeks, we'll be adding a new baby ensemble from Bucilla. It's an adorable jungle themed collection called "In the Jungle". Complete with baby monkeys, giraffes, and elephants, you won't want to miss this new baby ensemble. The baby quilt and baby bibs are stamped cross stitch kits. The baby birth announcement kit is a counted cross stitch kit. Make sure to check back to see these new baby embroidery kits from Bucilla. You'll find them in the Embroidery Kits section of the store! We've added new products to our Embroidery Supplies section. 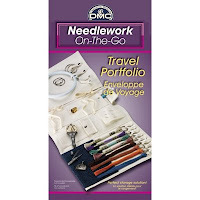 The DMC Needlework Travel Portfolio is an embroidery organizer and storage solution for Needlework On-The-Go. This attractive denim portfolio was designed for organizing needlework projects and embroidery supplies. A variety of pockets, tabs, and rings inside make it easy to store scissors, stitching accessories, embroidery floss, and needles. The How to Embroider Booklet from TNNA is an excellent learn-to-embroider resource for beginners and a ready reference for experienced needleworkers. This 39-page softcover book includes detailed illustrations throughout. You'll learn everything you need to know to get started stitching with confidence! If you're new to embroidery, make sure to visit the DMC Techniques page. 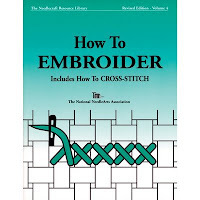 It's full of resources, tips, and tutorials to help you with your needlework projects. There's even a handy DMC Embroidery Stitch Guide, including step-by-step illustrations for a variety of embroidery stitches. Explore a variety of embroidery craft kits at Weekend Kits and be ready to embroider something new on your next Weekend at Home.